A year ago, with the effort of 72pines and China Bloger Network, Beijing held the first ever WordCamp outside of United States. It was a big hit, and the outcome was positive and encouraging. 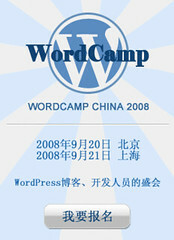 This year, WordCamp will return to China on September 20th and 21st, and the gathering will be officially named WordCamp China 2008. This time, there are going to be two gatherings in two different cities: 9/20 in Beijing and 9/21 in Shanghai. The biggest highlight this year is the fact that WordPress founder Matt Mullenweg will deliver keynote speeches in both cities. That’s another reason for Chinese bloggers to register for this year’s event. As far as I know, the two main organizers for this year’s event is 72pines and Xian Guo, so big props for them. I truly believe WordCamp China this year will be better and very successful, I will definitely keep my eyes on it when it is underway. Mona, I think this sort of gathering is okay and permitted in China, since its focus is mainly on technology. As long as it is not a political related gathering, I think the government is okay with it.